The primary proponent group for Prop 3 is Michigan Energy, Michigan Jobs. As of the July reporting date, it had raised $2.2 million, most of it from out of state environmental groups. The primary opponent is CARE – Clean Affordable Renewable Energy for Michigan Coalition. As of July, it had raised nearly $6 million, almost all of it from the two major utilities – Consumers and DTE. Ballot committees will report again to the state on their finances at the end of October. This calculation is for a consumer who pays a residential electric bill in Michigan. The CARE website, however, does not detail how the calculation is made. The figure is repeated in the TV ad "Bills," which says it will hit everry electric customer in Michigan. Responding to an inquiry from MTS, CARE said that the $2,500 figure is the result of taking the $12 billion cost estimate for Proposal 3 and dividing it by 4.8 million, the number of electric customers in Michigan. It is rare for public policy math to be so simple -- and this is not one of those rare occasions. First, the $12 billion figure originated with an estimate from Consumers Energy, which has bankrolled opposition to Prop 3. A study from Public Sector Consultants in Lansing, paid for by Prop 3 opponents, said rate increases would occur, "but it is not clear by how much." And not all electric customers are the same, obviously. The Michigan Public Service Commission says the average monthly bill for a residential user of 500 kilowatt hours is $71.94. The most recent customer count on the PSC website is from 2010, which lists 4.47 million total customers -- be they commercial or residential. The source for this claim is the 21st Century Jobs Fund Program Legislative Report of Sept. 30, 2011. It lists the Mascoma Corp. as receiving $47.4 million in "government dollars," although only $20 million of that came via the state's Centers of Energy Excellence program. Between the award date of Sept. 24, 2008, and Sept. 30, 2011, the time of the report, Mascoma reported only 3 direct jobs created. Mascoma, a firm specializing in biofuels, did say that 70 direct jobs were projected in 2012. 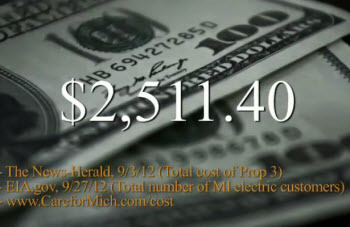 The ad cites the July campaign finance statement of Michigan Energy, Michigan Jobs, the pro-Prop 3 ballot committee and an Oct. 11, 2012, article in Michigan Capitol Confidential, the online site of the conservative Mackinac Center for Public Policy. The Capitol Confidential article plays connect the dots between a "California hedge fund billionaire" and Proposal 3. Tom Steyer, the story says, has donated at least $1 million to The Energy Foundation. That foundation, according to the New York Times, is the "sole contributor" behind the Green Tech Action Fund. As reported by Truth Squad back in July, the Green Tech Action Fund was the single largest contributor to the pro-Prop 3 ballot committee in the report filed in July. It gave $1.34 million of the approximately $2.25 million raised by Michigan Energy, Michigan Jobs. Ballot committees will file new finance reports in a few days. Of course, all of this is inference. The New York Times report is from April 2010 and refers to a California ballot fight. A review of Green Tech Action Fund's federal 990 tax form for 2010 shows it received $17.86 million in contributions and grants in 2009 and $6.73 million in contributions and grants in 2010. Under federal tax law, Green Tech, as a 501c4 group, is not required to list its donors. However, the large sums reported in the 990 complicate the effort to link Steyer to Proposal 3. Also, the ad says "billionaires." The Capitol Confidential story only refers to Steyer as a billionaire. Who are the others? The ad does not say. Again, no reference or citation is made. The provisions of Proposal 3 call for Michigan utilities to get the additional renewable power from inside Michigan or from adjacent areas served by a Michigan utility, so it's difficult to see how utility payments here mean millions sent to California. If it passes, Prop 3 is sure to spur a surge of wind turbine construction and while there are Michigan firms that produce wind turbine parts, Prop 3 does not prohibit the use of out-of-state manufacturing companies. This claim is cited to a Sept. 3, 2012, story by the News Herald. As previously reported by Truth Squad, the story reports "on the Michigan Electric Cooperative Association’s decision to join the opposition campaign to Proposal 3. It quotes MECA’s head on the $12 billion cost claim. "As noted in a previous Truth Squad analysis, the original source for the $12 billion figure is from an estimate from Consumers Energy, which has donated extensively to the Prop 3 opposition campaign." The citation provided does not give an independent source for the "billions of dollars to the electric bills" claim. The citation here is for Michigan Capitol Confidential, a website of the Mackinac Center, a free-market think tank that has been critical of energy mandates. It points to a July 2011 story that quoted an employee of a think tank in Washington, D.C., who also is critical of energy mandates. Since it was published in 2011, long before Proposal 3 was approved for the ballot, it cannot address the specifics of the measure. An analysis by the nonpartisan Citizens Research Council of Michigan said, "(I)t is expected that the cost of electricity will continue to increase in Michigan with or without adoption of this proposal." "Adoption of Proposal 2012-03 supposes that PA 295 would be amended to comply with the new constitutionally enhanced requirements." "The expectation is that the legislature will amend PA 295 of 2008 in accordance with the provisions of this proposed amendment. The details for how the higher standard would be phased in would be determined at that time." Adoption of Proposal 3 would require a great deal of legal and regulatory work. Overall impression: These ads focus on costs – to implement Prop 3 and to utility consumers. Unfortunately, the figures and information available to date do not give independent sourcing for the $12 billion implementation figure or the "thousands" in new costs on utility bills. Foul or no foul: Foul on the CARE website for implying that the average residential customer would see a $2,511 utility bill increase when that calculation is not based on a detailed or reasonable cost-sharing allocation between the many different types of residential and commercial electricity customers. Warnings on the ad claims that "California billionaires" are financing the pro campaign and that "millions" will go to California. The facts, as reported to date, don't support those conclusions. Thank you for the innformation! These are the kinds of things I need and want to know before this election so that I can make informed and educated decisions. Great investigating CARE's negative claims regarding Prosal 3! What needs investigating is Consumers Energy rate increase request last month for $148.3Million dollar annuall renewable rate increast to pay stock dividends of !0.50% from money charged us electricity users of Consumers Energy. Why is money like this used to meet the 2008 mandate already set up. They are far from achieving the 10% and since they want more money from us customers to pay stock holders there is a conflict of interest here namely us as customers! I congratulate Bridge's TRUTH SQUAD again standing up for truth in advertising -- even (or maybe especially) when the false advertising advocates a position that your parent Center for Michigan has supported. One issue that you raised in your analysis, but did not comment on, is the suggestion that most or all the money being used to fight the 25% alternative energy proposal is coming from the two major utilities. I am interested in finding out how these utility companies are financing the anti-25/25 campaign. Are these utilities using "profits" or reserves generated by their residential or commercial customers to, as the TRUTH SQUAD might say, wage war against the truth? If so, how does a residential or commercial customer who objects to this add-on to their monthly utility bills vote with their feet? Are we supposed to go back to heating our businesses with firewood or should we heat our homes with these 30 second TV spots that appear to be made of semi-dried cow pies? And where is the Public Service Commission in all this? To the editor, I want to commend the Michigan Truth Squad for letting voters know about the big utility money behind anti-Proposal 3 ads and encourage your referees to dig deeper into the sources cited by these ads. Your fact checkers correctly note that CARE for Michigan’s advertising cites the Mackinac Center for Public Policy, but the money trail does not end there. I have seen documentation showing the Mackinac Center has received tens of thousands of dollars from Exxon Mobil and Koch Industries. Voters need to be aware of the oil and coal money behind the Mackinac Center, so they can judge for themselves the credibility of this so called think tank as source of information on clean energy policy. I also encourage the Michigan Truth Squad to fact check claims made about Prop 3 by a website and mailings paid for by the Americans for Prosperity Michigan Ballot Committee. According to FactCheck.org, Americans for Prosperity was founded by David Koch of Koch Industries. Mr. Koch, who resides in New York City, owes his status as one of the world’s wealthiest billionaires in part to his companies’ coal, oil, and natural gas operations. Another group funded by the Koch family, the American Legislative Exchange Council (based in Washington, D.C.), has crafted cut and paste legislation to repeal renewable energy standards in states across the nation. It’s probably no coincidence that a recent Mackinac Center study exaggerates the cost of Prop 3 and Michigan’s current 10% renewable energy standard by ignoring the rate caps found in both. Similarly, AFP-MI Foundation has tested the political waters by circulating a questionnaire asking candidates, “Would you vote to and will you work to mandate that 25% of energy production must be from renewables in Michigan by 2025?” If Proposal 3 fails, these special interest groups funded by the fossil fuel industry will likely target Michigan’s current 10% by 2025 renewable energy standard for repeal. Voters need to be aware of the overall agenda being pursued by these organizations in order the place their misleading claims about Prop 3 in context. As both a previous business owner and professor with over 30 years of experience in renewable energy.I am greatly disturbed by big polluters’ efforts to deceive voters about Prop 3. I have worked with DTE Energy to install solar photovoltaic panels at Oakland Community College, and know first-hand that renewable energy technology can work here in Michigan in a cost effective manner that produces more health and more jobs. Sincerely, Debra Rowe, Ph.D.